Autonomy vote at issue in Sulu cathedral bombing? Twin explosions have left at least 20 dead and some 80 wounded at the cathedral in Jolo, capital of Sulu province in the restive southern Philippine island of Mindanao. The first blast went off inside the Cathedral of Our Lady of Mount Carmel as Sunday mass was about to start. This was followed a few seconds later by another blast in the cathedral's parking area. The attack came just days after the Bangsamoro Organic Law was approved by voters in the region, creating a new Muslim-led autonomous government, The new Bangsamoro autonomous region replaces the weaker Autonomous Region in Muslim Mindanao (ARMM). More than 1.5 million ARMM residents voted "yes" to BOL ratification, while some 199,000 voted "no." Of the five provinces in the autonomous region, the only one to reject the BOL was Sulu—by a vote of some 163,500 to 137,630. Assad regime artillery struck areas of Syria's opposition-held Idlib province Jan. 12 after militants allegedly tried to infiltrate regime-held areas, according to state news agency SANA. The shelling was reportedly focused on the town of Tamanaa near Maaret al-Numan, which was seized from Turkish-backed rebels by jihadist forces earlier in the week. The was apparently part of a ceasefire agreement ending an internal conflict between rival opposition forces in Idlib. Much of the governorate's territory was reportedly turned over to the so-called "Salvation Government"—administrative arm of Hayat Tahrir al-Sham (HTS), the successor organization to disbanded al-Qaeda affiliate Nusra Front. Constituent militias of the rival Turkish-backed National Liberation Front have reportedly retreated to the Turkish-held enclave of Afrin across the border in Aleppo governorate. (Rudaw, AFP) These ominous developments may spell an end to Idlib's reprieve from the threatened Assad offensiive on the province since establishment of a joint Turkish-Russian buffer zone there. 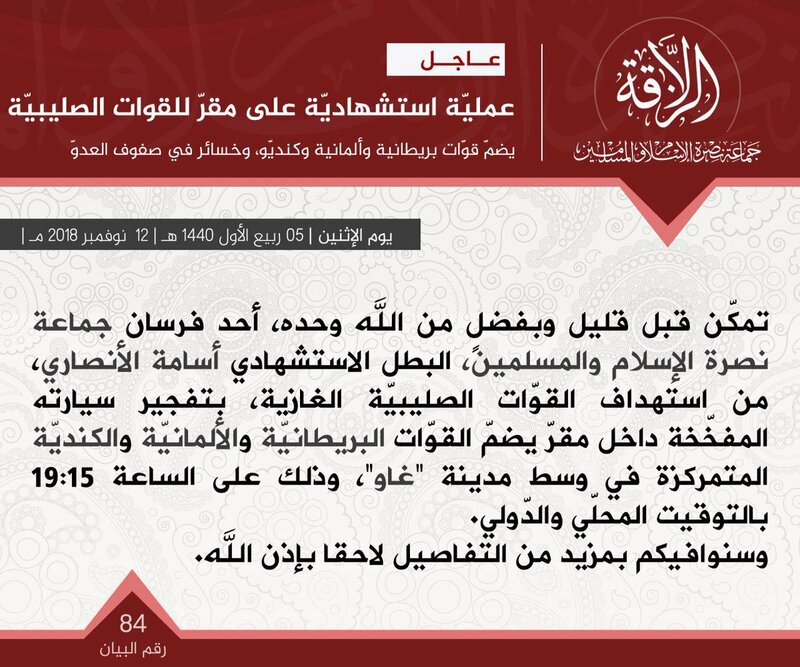 The Group for Support of Islam and Muslims (JNIM), al-Qaeda's branch in West Africa and the Sahel, claimed its forces were responsible for a suicide bombing in the northern Malian city of Gao Nov. 12. The suicide truck-bomb detonated in a residential area of Gao, killing three (not counting the attacker) and wounding another 30. The JNIM statement claimed the target was a base of "Crusader invaders" from the United Kingdom, Germany and Canada. However, all of those killed were civilians and local Malians. Four of the wounded were foreign employees of the United Nations' Mine Action Service, working to remove landmines in the area. They included two Cambodians, a South African, and a Zimbabwean. A video later released by JNIM confirmed that the mine-dismantling headquarters in Gao was the intended target. The video stated that "this operation demonstrates that the mujahideen are continuing upon their covenant, which they had made to their lord, until they achieve one of the two good ends, victory or martyrdom." The statement said the group will continue to target international forces until "the ummah [Musilm community] enjoys the rule of shariah." The US government has reinforced counter-terrorism controls on aid operations in Syria. New contractual terms require US-funded organizations to get special permission to provide relief in areas controlled by extremist groups. The move further complicates aid operations for those trapped in Syria’s last rebel stronghold, Idlib, where two thirds of its three million people need assistance. The top UN official for the Syrian humanitarian crisis, Panos Moumtzis, told IRIN news agency that donors were, in general, backing away from funding all but the most critical needs in Idlib, fearing aid will fall into the hands of groups such as the al-Qaeda affiliate Hay'at Tahrir al-Sham (HTS). Did John McCain meet with jihadists in Syria? Upon his death, many are reviving the discredited claim that John McCain met with ISIS on his Syria trip in 2013. But some are settling for the less ambitious, and perhaps plausible, claim that he met with jihadists who were implicated in atrocities. E.g. the always annoying Ben Norton tweets: "John McCain was a staunch supporter of the CIA-backed, al-Qaeda-linked Salafi extremist opposition in Syria. In fact the late senator posed in a photo with a rebel who was involved in kidnapping 11 Lebanese Shia civilians." He links to a May 10, 2013 Reuters story which cites an undated article in Lebanon's Daily Star (apparently not translated into English) claiming that McCain was photographed in Syria with a rebel "implicated in" the kidnapping of 11 Lebanese Shi'ite pilgrims the previous year. The man in question was apparently one Mohammad Nour—"identified by two freed hostages as the chief spokesman and photographer for the Northern Storm brigade that kidnapped them."